In this lesson, we will learn how to calculate the impulse of a constant force on a body and its relation with the change in the momentum of this body. A constant force acted on a body of mass 6 kg. As a result, its speed changed from 37 km/h to 49 km/h. Calculate the magnitude of the impulse of this force on this body. A tennis ball of mass 57 g was moving horizontally at 68.4 m/s when it collided with a vertical racket that was at rest, after which it rebounded at 18.8 m/s. Given that the contact time between the ball and racket was 1 2 5 of a second, find the magnitude of the average impact force. Three forces: ⃑ 𝐹 =  − 5 ⃑ 𝑖 − 2 ⃑ 𝑗 + 2 ⃑ 𝑘  1 N , ⃑ 𝐹 =  ⃑ 𝑗 − 3 ⃑ 𝑘  2 N , and ⃑ 𝐹 =  − ⃑ 𝑖 − 5 ⃑ 𝑗 − 2 ⃑ 𝑘  3 N , where ⃑ 𝑖 , ⃑ 𝑗 , and ⃑ 𝑘 are three mutually perpendicular unit vectors. The forces acted on a body for 3 seconds. Find the magnitude of their combined impulse on the body. A constant force acted on a body of mass 𝑚 changing its speed from 9 m/s to 54 km/h. Given that the impulse of the force was 5.82 N⋅s, determine the value of 𝑚 . A smooth sphere of mass 1 412 g was moving horizontally in a straight line at 13.5 m/s when it hit a smooth vertical wall and rebounded at 9 m/s. Determine the magnitude of the impulse exerted on the sphere. A sphere of mass 125 g was moving along a section of horizontal ground at 165 cm/s when it hit a vertical wall. Given that the wall applied an impulse of magnitude 0.214 N⋅s to the sphere, find the speed of the sphere as it bounced off the wall. A railway carriage of mass 23 t was moving at 14 m/s before it crashed into a barrier. 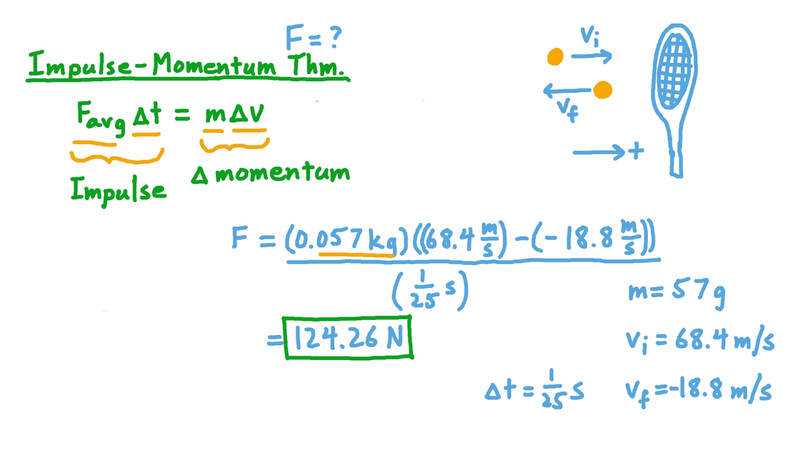 Given that it took 4 s for the carriage to come to rest, determine the magnitude of the impulse 𝐼 and the average force 𝐹 to the nearest kilogram weight. Consider the acceleration due to gravity to be 9.8 m/s2. A machine gun fires 840 bullets per minute at a steel wall. Each bullet has a mass of 24.5 g and its speed when it hits the wall is 120 m/s. Find the force acting on the wall given that each bullet rebounds at 30 m/s. Take 𝑔 = 9 . 8 / m s 2 . A sphere of mass 83 g fell vertically from a height of 8.1 m onto a section of horizontal ground. It rebounded and reached a height of 3.6 m. Given that the duration of the impact was 0.42 seconds, and the acceleration due to gravity is 9.8 m/s2, find the average impact force to the nearest two decimal places. A ball of mass 560 g fell 3.6 m onto a section of horizontal ground. It rebounded to a height of 1.6 m. Given that the ball and the ground were in contact for 0.08 seconds, determine the average impact force between the ball and the ground. Take . A ball of mass 5 kg fell from a height of 6.4 m onto a section of horizontal ground. It rebounded to a height of 2.5 m. Given that the duration of the impact was 0.5 seconds, determine the magnitude of the average force the ground exerted on the ball. Take 𝑔 = 9 . 8 / m s  . A rocket was ascending vertically, projecting its burnt fuel at 3 600 km/h vertically downwards. Given that, for every 8 seconds, it expelled 3 kg of fuel, find the lift force generated by the rocket’s engine. A smooth ball of mass 240 g was projected vertically upward at 16 m/s toward a horizontal ceiling 390 cm above the ground. The ball collided with the ceiling and rebounded vertically downward. The magnitude of the impact force acting on the ceiling from the ball was 960 g-wt, and they were in contact for 1 2 of a second. Determine the ball’s speed when it rebounded from the ceiling. Consider the acceleration due to gravity to be 9.8 m/s2. A body of mass 349 g was projected vertically upwards at 539 m/s from a point which was 78 cm below the ceiling of a room. When it hit the ceiling, it rebounded and, 0.6 seconds later, it hit the floor. Given that the height of the ceiling was 390 cm, and the duration of the impact was 1 7 seconds, find the impact force to the nearest newton. Consider the acceleration due to gravity to be 9.8 m/s2. The given figure shows a force-time graph for a force acting in a constant direction on a body moving along a smooth horizontal plane. Using the information provided, calculate the magnitude of the force’s impulse. The given figure shows a force-time graph. At time 𝑡 seconds, where 𝑡 ⩾ 0 , the force is given by 𝐹 = ( 𝑡 − 2 ) 2 N . Find the impulse over the first four seconds. The given figure shows a force-time graph. At time 𝑡 seconds, where 𝑡 ⩾ 0 , the force is given by 𝐹 =  ( 𝑡 − 3 ) + 4   N . Find its impulse during the sixth second. Two forces F  and F  act on a body of unit mass for 19 seconds. Given that F i j  = ( − 8 − 4 ) N and F i j  = ( + 3 ) N , find the magnitude of the impulse. The forces ⃑ 𝐹 = 𝑎 ⃑ 𝑖 + 3 ⃑ 𝑗 1 , ⃑ 𝐹 = − 3 ⃑ 𝑖 + 𝑏 ⃑ 𝑗 2 , and ⃑ 𝐹 = 𝑎 ⃑ 𝑖 − 3 ⃑ 𝑗 3 acted on a body for 3 seconds. If their combined impulse on the body was ⃑ 𝐼 = 3 ⃑ 𝑖 − 6 ⃑ 𝑗 , find the values of 𝑎 and 𝑏 . A ball of mass 135 g fell from the top of a tower that was 206.1 m tall. At the same moment, another ball of the same mass was projected vertically upwards from the base of the tower at 68.7 m/s. Find the time 𝑡 of their collision and its height 𝑥 above the ground. Consider the acceleration due to gravity to be 𝑔 = 9 . 8 / m s 2 . A rubber ball fell from a height of 7.2 m. When it hit the ground, it bounced back to a height of 2.7 m. Find the velocity of the ball as it rebounded from the ground. Take the acceleration due to gravity . A boy was practicing kick-ups. Given that the ball took 2.6 seconds to return to his foot after he kicked it and that 𝑔 = 9 . 8 / m s 2 , determine the velocity of the ball just after he kicked it. A body was projected vertically upwards at 12.74 m/s from the top of a tower. Find the time taken for the body to return to the point of projection. Consider the acceleration due to gravity to be 𝑔 = 9 . 8 / m s 2 . A body started falling from a point that is 104.4 m above the ground. At the same time, another body was projected vertically upwards at 40.6 m/s from the ground. The two bodies met at a point 𝑑 metres above the ground at time 𝑡 . Find 𝑡 and 𝑑 , and determine whether the two bodies met while moving in the same or opposite directions. Take 𝑔 = 9 . 8 / m s 2 . A stone was thrown into a well at 4.5 m/s and reached the bottom 4 seconds later. Given that 𝑔 = 9 . 8 / m s 2 , determine the stone’s velocity when it reached the bottom of the well.